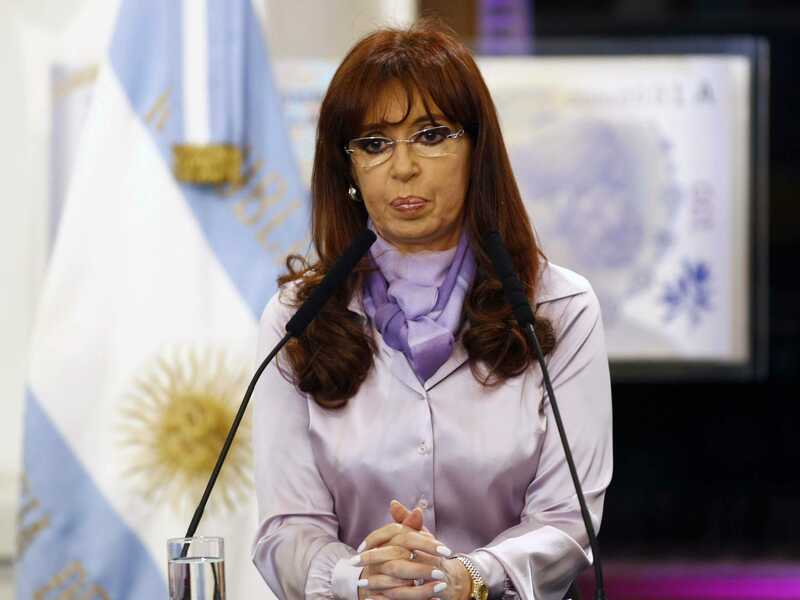 ReutersArgentine President Cristina Fernandez de Kirchner. After a whipsaw summer that included the close of a decade-long lawsuit, a technical default, the most dramatic of political theatrics, and a contempt ruling from a US court — things have been relatively silent out of Argentina. But some rumblings out of Wall Street indicate that there could be a change afoot. One word — “acceleration” — threatens to force an end to the stalemate between Buenos Aires and its creditors that has been in place since the country went into default this summer. Acceleration is the nuclear option. It is the ultimate expression of the collective belief that Argentina will not pay bondholders. With acceleration, all bondholders call in their entire debt immediately. In its fullest expression, that amount in the tens of billions of dollars — far greater than what Argentina, with only $US28 billion in its central bank reserves, can pay. The country went into default this summer for refusing to pay a group of holdout bondholders led by Paul Singer of Elliott Management. For years the holdouts insisted on being paid 100 cents on the dollar for Argentine bonds dating back to the country’s 2001 default. They argued that all bondholders, regardless of whether they had accepted a haircut on their debt, should be paid equally. That argument won, but Argentina did not care. And in not caring, Argentina made it impossible to pay the bondholders who had restructured their debt, the exchange bondholders. That is, until January, when the country says it can finally legally negotiate with the holdouts. It is the frustrated exchange bondholders who are now dangling the threat of “acceleration” in Argentina’s face. After default, Argentina set up a mechanism for exchange bondholders to get paid in Buenos Aires, instead of New York, but it hasn’t worked. The country missed an interest payment due at the end of October. The money, $US161 million deposited last month, still sits in custody and the government won’t talk say whether or not anyone has collected. That is why exchange bondholders have been talking about acceleration — a move that could lead to yet another protracted legal battle with The Republic. In August, exchange bondholder hedge fund Owl Creek Asset Management gave a presentation about Argentina, Bloomberg says. In it, the fund detailed how it could use the threat of acceleration to get a better seat at the negotiating table in January. For that to happen, Owl Creek would have to get 25% of bondholders holding debt maturing in 2038 to agree to acceleration. Argentina, for its part, has said these exchange bondholders should blame the holdouts for their troubles — and US judge Thomas Griesa, who ruled in the holdouts’ favour. So what could actually happen? If no one accelerates, the saga between the holdouts continues into next year. Exchange bondholders have said that they’re looking to January to see if Argentina actually negotiates with the holdouts. But, of course, there is the potential that enough bondholders do agree to accelerate. Because Argentina could not pay all the exchange bondholder debt at once, it would have to restructure. This could take negotiations out of the country’s hands and place them in the hands of a court and bondholders. That would save face for Argentine President Cristina Fernandez de Kirchner, who has said that her hands are tied as long as the holdouts, which she calls “vultures,” will not allow her to make any payments to anyone. Of course, Elliott Management’s Singer and the holdouts may not like the terms they get in this type of restructuring. Argentina might not like them either, and another legal battle could ensue — if Argentina has the stomach for it. Given how Argentina has behaved through this entire drama, it’s not crazy to think The Republic may in January continue to resist negotiating with holdouts. It could be that this threat of acceleration is one way exchange bondholders ensure that they do. That worsened economic situation means that Argentina is running out of time. It is hard to read the signs out of Buenos Aires, but the president and her administration may have been waiting for a new government to deal with this issue — one that would not take power until December 2015. Now that option is gone. Low commodity prices, capital flight, inflation, and inclement weather have all wreaked havoc on the country’s economy, Argentina doesn’t have time to waste. Dollar reserves are low, and to continue to pay the debt it is servicing, those reserves could dwindle down to $US15 billion by the middle of next year. “The most time they have is through the end of summer vacation in Argentina, which is February,” Loser said. Now, it seems, the vultures are truly starting to circle.